Voici mon premier vrai wallpaper sur guilty crown. J'ai longtemps chercher car n'étant pas une pro en se qui concerne se genre de création j'ai tester diverse chose. 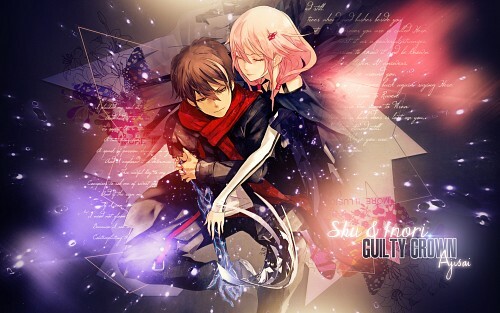 Here is my first real wallpaper guilty crown on. I look for a long time is not a pro by itself for such creation I test various things. Kotekigo: It does me no problem to do it again I just need the dimensions. It's 1600:900. Just lenghten the sides, you know. Shu and Inori look good, I like the purple color for the background and the little butterfly.